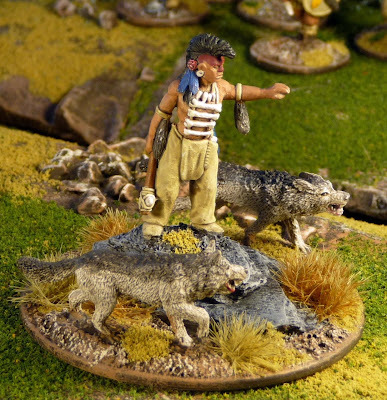 wargaming in 28 mm and sometimes smaller: Skraeling Warlord and who were the Skraelings anyway? For the bases in my SAGA, I am going with a late fall or winter look. I will get more into to this when I get into the terrain part of my project. But for now suffice to say, that my Newfoundland is not one of the bucolic photos of L'anse aux Meadows. My Newfoundland is a harsh place; one of wind, bitting cold and snow. And there are a lot of rocks! Slate and granite is quite common on the northern peninsula of the island, so I thought I would have my native chieftain posed on the same. I like how the stone erupts sometimes from the ground. I got some wolves from Reaper miniatures, these I thought looked nice and vicious and appeared to be of the correct size. The Newfoundland wolf was a sub species of the North American Grey Wolf. There is one mounted specimen in the Newfoundland Museum, and has you can see it was distinct for the black streak down it's back. Well I suppose most of us know that Skraeling is the Old Norse/Icelandic for the native people that the Norse Greenlanders used for the native people they encountered in the North America and Greenland. The term probably comes from norse word skrá meaning skin. The Norse wore woolen clothing and referred to the skin covered natives as such. It is interesting to note that this term first appeared in written sources in the 13th century Greenland Sagas, but clearly refers back to the people the Vikings encountered in Vinland in at the end of 10th century. So who were these Vinland (Newfoundland) natives. When I started off this project, I automatically assumed that they were the Beothuks, a native Newfoundland tribe that died out in the early 19th century, but the more I got into it the more I realized that I had simplified things. 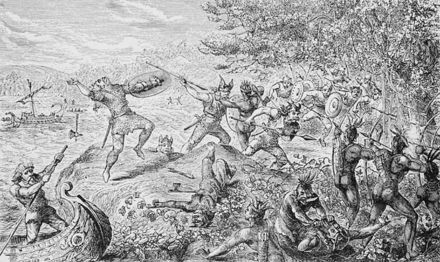 I quickly found that the Beothuk culture only started in the 14th century, so were these aboriginals ancestors of these Beothuks? There was other choices though, they could they have been the Dorset culture, another extinct aboriginal group who existed in the high arctic, as well as Baffin Island and northern Labrador. This severe cold adapted culture died out during the Medieval warm period as well as being displaced by the Thule culture (the ancestors of present day Labrador and Greenland Inuit who arrived from Alaska in the 13th century, now commonly known as the Eskimos or Inuit). Other possibilities include the Innu, an Indian tribe existing in Labrador for hundreds of years prior (and most likely descended from the same Maritime Archaic Culture as the Beothuks and the Dorsets) or were they an off shoot of a more southern Algonquian tribe who somehow another migrated north. Maybe this map will help. It is a little confusing, trying to mesh the two written 13th century Viking Sagas (Greenlander's Saga, Eiriks Saga Rauda) that were written 200 years after the settlement of Vinland with archaeological/anthropological on Newfoundland aboriginals who are all now extinct. I have found this time line which will be quite helpful to develop a campaign scenario for my SAGA Vikings and Skraelings if I so desire. But let's get back to the original problem, on how to paint my Skraelings. Did they paint themselves red, what weapons did they have and how did they dress? 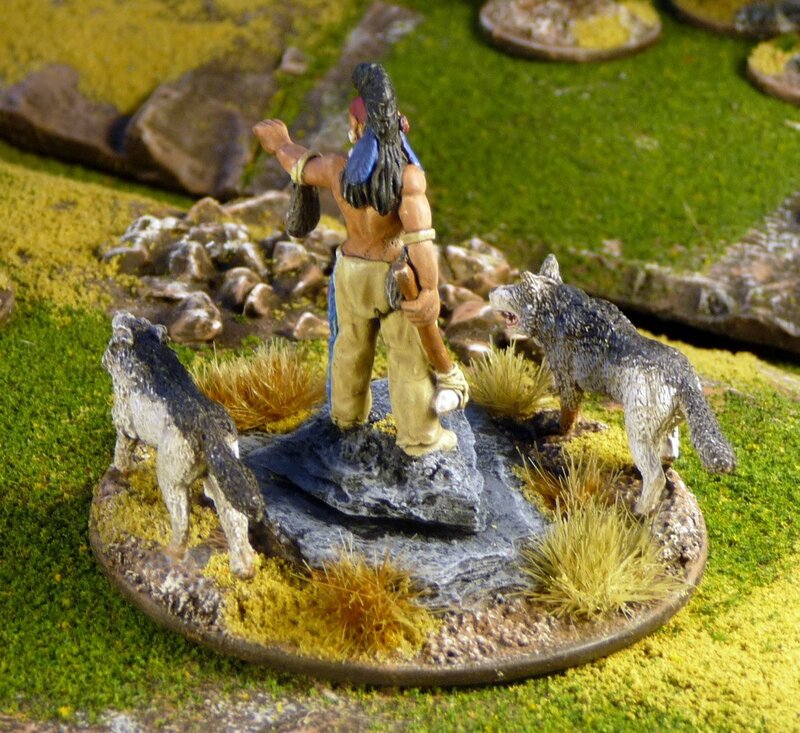 I suppose I should also ask are the figures supplied by Gripping Beast accurate. Well first, I think that there their clothing is correct, but there is not enough of it. 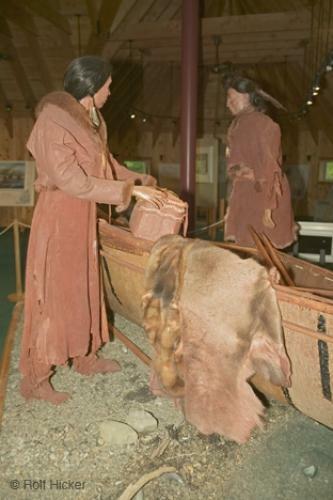 Here is a photo in a Beothuk exhibit in a Newfoundland museum. Well the hair looks right, but maybe modeling on a bit more clothing would have helped, but I suppose one could say they are not really dressed for fighting and that it is not cold all the time in Newfoundland! I wish that the Gripping beast Skraelings all had similar hairstyles and that the mohawk style was not used for the warriors and the Warlord. 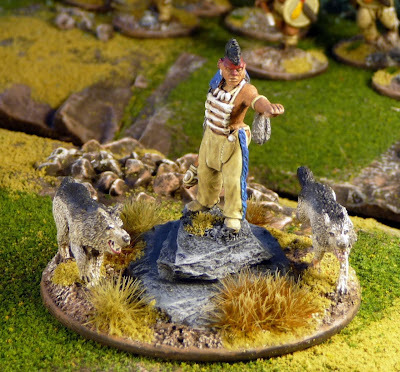 A little research reveals that this style is associated with the Iroquois nation, clearly not a player here. So let's get to the weapons, well they generally seem to be correct, unless the aboriginals the Vikings encountered were Dorset Indians, as the bow and arrow was unknown to them. I wish I could find reference in the Greenland Sagas to the weapons the Skraelings used, I see reference to javelins and I believe that bone or stone points would have been used, but no clear reference to bows. Certainly the Beothuks used bows. No metal though, so that is good. Finally, how about the red ochre. Well clearly the Beothuks smeared it on their skin, clothing and weapons, and I have addition seen reference to them sometimes painting their faces black. Is there any direct reference in the Viking Sagas to the Skraelings being red? But why not I said, if the Beothuks did it and the Skraelings were the ancestors of them, there is no reason to believe that they suddenly started using red ochre in 1500. Well anyway that is enough for now, and comments are appreciated. Very, very cool post, John. I really like the history you've uncovered in preparation for your project. I'll definitely have to poach some of your hard work and do-up a warband for my Vikings to encounter. Thanks Curt, feel free. I am think I am going to try to string together some sort of campaign, to tell the story of the Vikings and the Skraelings. You certainly do your research and the bases look superb. What a fantastic looking figure and excellent info too. you may well have swayed me into my own Skraelings!!! Bad boy! Very nice and great history background write up! Sorry that my comments have been lacking on your blog for awhile. Just started up the blog again and now finally catching up on all my favorite blogs.